TheWave_GB - This image has been (or is hereby) released into the public domain by its author, Gb1 at the English Wikipedia project. This applies worldwide. What a great place to visit, if you are patient about waiting to win the lottery of only 20 people (10 in person and 10 from an online lottery) to get to see “The Wave” each day (see LATimes article below). Actually, having so few people each day would be a blessing, because you actually get to see it in its natural beauty without hundreds of people milling around in it at the same time. There is a wonderful collection of images taken of “The Wave” at Flickr and presented in a slide show. Or you can look at them in the normal format in “The Wave Pool” set here. 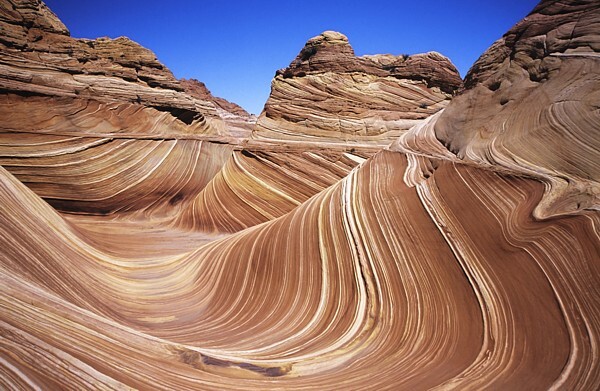 It’s called the Wave: a huge, undulating formation in the stark Arizona desert. It’s the star among the surreal rocks that fill this part of the stark Southwestern landscape. and a here’s the Wikpedia article. This is one of many wonders just in our own country that I would love to see one day.